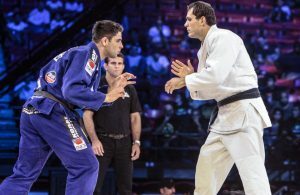 The two-day Gracie Pro 2017 jiu-jitsu competition will conclude with one of the most anticipated rematches of all time when Marcus "Buchecha" Almeida clashes with Roger Gracie. RIO DE JANEIRO, BRAZIL – This weekend, on Saturday, July 22nd and Sunday, July 23rd, the best jiu-jitsu fighters in the world will descend on Rio’s Olympic Park in Barra da Tijuca in the Zona Oeste (West Zone) of the city for the Gracie Pro 2017. Marcus “Buchecha” Almeida and Roger Gracie, seen here in their 2012 battle, will face again this Sunday at the 2017 Gracie Pro at Olympic Park, photo internet reproduction. The event will feature a titanic heavyweight battle on Sunday between the man most consider the greatest heavyweight of all time, Roger Gracie, against the present-day heavyweight king, Marcus “Buchecha” Almeida. “Two great champions will face off in a historic struggle in an Olympic arena,” said Kyra Gracie, head of Gracie Pro and creator of the event. Sunday’s highly anticipated Gracie-“Buchecha” match has been five years in the making since the two first fought to a draw in 2012. The rematch will be a ten-minute bout under International Brazilian Jiu-Jitsu Federation (IBJJF) rules. The 2017 Gracie Pro will kick off on Saturday when about a thousand children from various social projects throughout the city will attend various jiu-jitsu seminars and self-defense clinics. It will continue with regular jiu-jitsu tournament matches in various categories from kids to adults to master and seniors, with the finals in each category taking place on Sunday before the massive Gracie-“Buchecha” battle. The event is sponsored by Gracie Pro in partnership with the Olympic Legacy Governance Authority (AGLO), the agency that manages the four facilities at Olympic Park in Barra da Tijuca. The 2017 Gracie Pro will take place at Carioca Arena 1, the site of Rio 2016 Olympic basketball games and Paralympic wheelchair basketball games. Tickets for the event can be purchased at the Gracie Pro website.